Philharmonisches Staatsorchester Hamburg / Kent Nagano. Staatsoper Hamburg, Hamburg, Germany. Sunday, February 12th, 2017. 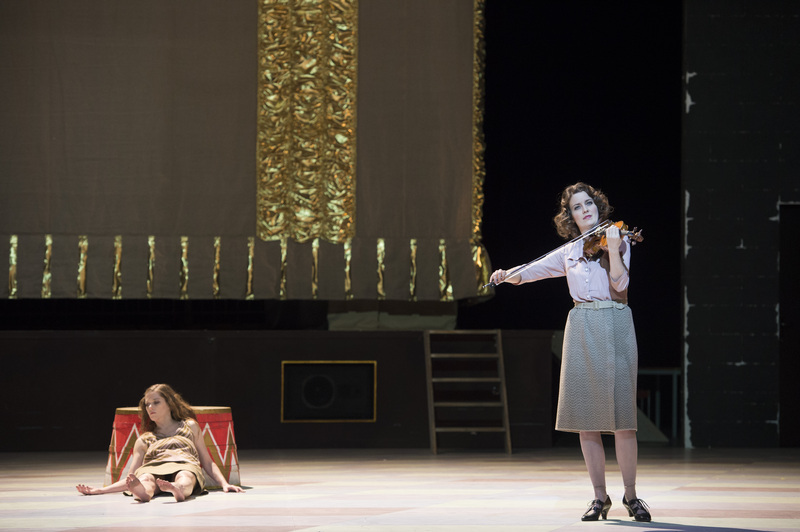 Tonight’s performance of Berg’s unfinished chef d’œuvre in Hamburg must certainly have been one of the most hotly anticipated premieres of the season. The pre-eminent performer today of the insanely challenging title role was joined by a very strong ensemble cast. Add into the mix one of the leading conductors of the twentieth-century repertoire and one of the most original and thought-provoking stage directors, then clearly Hamburg had the ingredients for a very interesting evening. There was definitely a buzz in this capacity audience and the show was generously applauded at curtain down. This was without doubt thoughtful and insightful music theatre. If that makes it sound quite dry, that was most certainly not the case. Rather, this was a show that revealed itself slowly and invited its spectator to consider what was seen and indeed also was unseen. Marthaler offered us a reflection on loneliness and isolation as well as a questioning of the true nature of reality. As the first act began, we saw the Painter painting an image of Lulu – not Lulu herself, who was sitting for him, but rather an image of an image. When we first see Lulu, she appears to be emotionless. As the evening develops, we come to realize that this coldness we initially perceive in her is shared by the whole community. This large ensemble cast was made up of individuals who barely looked at each other, who would walk around the stage almost as if in a trance. For them, Lulu was a blank canvas upon whom each person projected their ideal of who they expected her to be. In some respects, one could criticize Marthaler for not giving us fully-developed, flesh and blood characters. So much of his storytelling was established simply through the positioning of individuals on stage. Marthaler also introduces a corps of actresses who at one point are seen lying on the floor in the same manner as we see Lulu at the beginning. Lulu perhaps is not only the multiple visions of each of her lovers but could even be any woman. I do feel that Marthaler’s theatrical argument works, because what he shows us are people who are incapable of knowing Lulu because they are incapable of knowing themselves. There’s a loneliness to this idea that I find most compelling. Marthaler also raises another issue about how much of reality is in fact a performance. 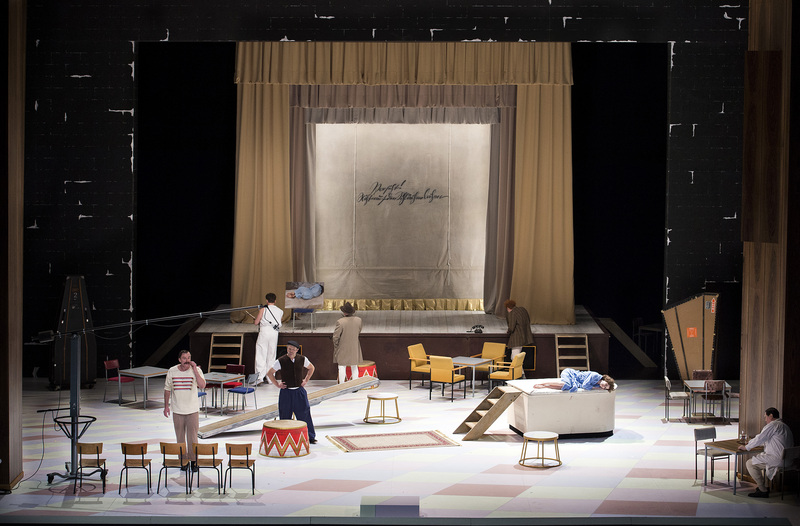 We see a stage within a stage in Act 1, and Act 2 appears to be set in a recording studio. 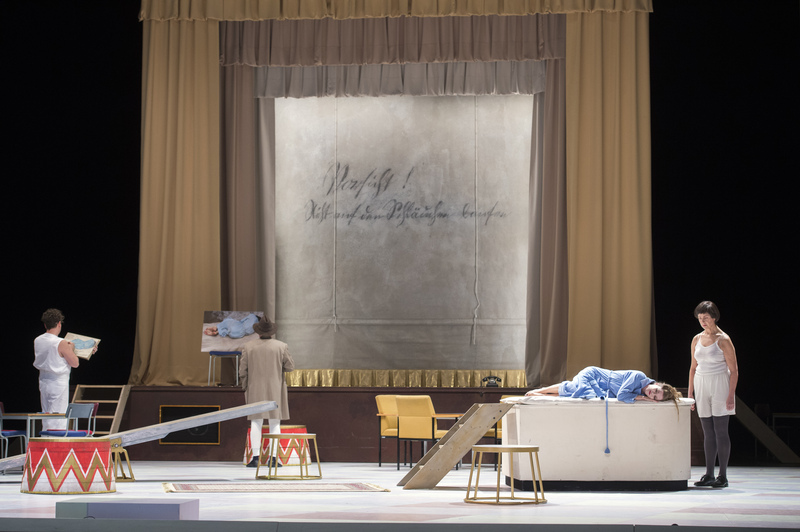 As the Painter and Dr Goll die, they do so on stage. Dr Schön dies in the studio. There is an intriguing kernel of an idea here but I’m not quite convinced that Marthaler fully runs with it. If so far this sounds quite cerebral, what Marthaler – in conjuction with tonight’s conductor, Kent Nagano – did with the unfinished Act 3 was really quite ingenious. At his death, Berg left the score almost complete but unorchestrated. This was partly due to him taking time away from the composition of the opera to focus on his violin concerto. Rather than perform Act 3 in the now commonplace Cerha completion, tonight it was performed in a new arrangement for two pianos, violin and a small off-stage band. The sparseness of the sound world really drew attention to the isolation of the characters. Lulu died to the sound of piano and tam-tam. Nothing more. I found it most powerful in its understatement. What followed was completely unexpected – a complete performance of the violin concerto, gutsily and passionately played by Veronika Eberle. I have mixed feelings about this as a solution. While she played, Lulu resurrected herself from the dead and played a mime show with the corps of actresses. As a coda, it had its merits, working in the same was as a digestif after a hearty meal. 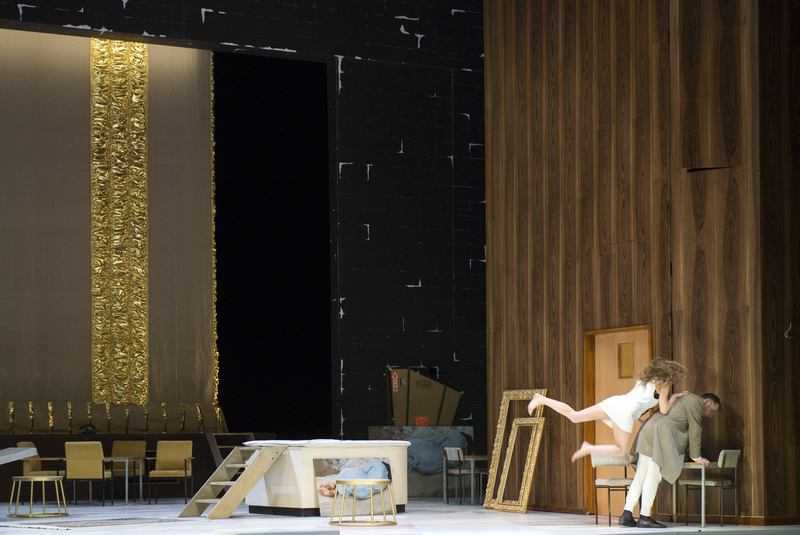 In many ways, it also gave comfort after the dysfunction and horror of the opera proper, yet at the same time, it drew attention from the main work and took the evening to a completely new direction and almost made us forget about the opera’s protagonists. It’s a solution I’m glad to have had the opportunity to see, if not one perhaps I would hurry to see again. Any performance of Lulu, lives by its titular character and tonight Barbara Hannigan gave a superhuman performance. Hers was a Lulu of extreme physicality, singing some extreme excursions into the stratosphere while standing on her head or lying on her back with her legs in the air. Despite the fiendish challenges of the vocal line, this was a performance that was really sung off the text – every word was crystal-clear as indeed it was for the whole cast. She was completely vocally and physically indefatigable throughout a very long evening and her accuracy in pitching was staggering. Her soprano has a pearly beauty, even if now and then the tone can tend sound slightly shallow. This was an awe-inspiring performance by an artist of such immense physical and musical talent and ability. Anne Sofie von Otter’s mezzo is still very much instantly recognizable. What struck me was her willingness to sacrifice the beauty of that warm and generous tone in her desperate cries of ‘erbarm dich mein’. I was particularly impressed by Peter Lodahl who dispatched his angular lines with the utmost assurance and scaled the equally extreme tessitura with incredible skill in an ardent and handsome lyric tenor. Sergei Leiferkus’ Russian-accented German really helped to project Schigolch as very much an outsider. The voice is still very much there with real amplitude and is absolutely rock steady. Matthias Klink’s Alwa was sung with an easy top and good resonance. Jochen Schmeckenbecher sounded slightly dry but the vibrations were even and he was a positive and dominating stage presence. I also enjoyed Ivan Ludlow’s brawny baritone and Marta Świderska’s nicely raspy mezzo. Nagano’s conducting brought out the depth and range of the orchestration with lush, deeply carpeted strings and piquant winds. His was a romantic reading focusing less on an X-ray analysis of this multifaceted score but offered something broader in romantic sweep. Certainly the way he allowed the comparison between the big romantic outbursts and the intimacy of the Act 3 completion to register was most impressive. The orchestra played extremely well – yes there were some small intonation lapses here and there, but their assurance in this demanding music was certainly most impressive. I’m sure that there will be some who wouldn’t have appreciated this Lulu due to its departure from the published Cerha completion and the addition of the violin concerto. Yet, I felt that not only did it have something important to say but that it also penetrated into the heart of the work and presented an almost nihilistic emptiness that, thanks to the chamber-sized forces, drew one into the intimacy of Lulu’s world. Perhaps the comfort and reflection that the violin concerto brought is the only way to bring conclusion to a work that forces us to confront and reflect on loneliness and our connection with others. It would be hard to imagine it better sung than this exceptional cast sang the work tonight. Do you ever simply listen to this opera at home on CD?